If you need any diagnostic imaging system just send email and let us know what you are looking to buy, when you are looking to buy and maybe even your price target. Designed for convenience, the CR-ITX 560 System accelerates clinical workflow and helps improve productivity. All imaging functions can be performed at the point of patient care with this compact, lightweight system that includes a single-plate CR reader, x-ray generator, PC-based workstation with touch-screen monitor, and portable battery source. KODAK Quality Control Software, the engine that "drives" the KODAK Point-of-Care CR-ITX 560 System, is designed to streamline clinical workflow and maximize productivity. With its modular design, the Quality Control Workstation Software eliminates steps in image scanning, processing, and reviewing for enhanced quality assurance. Users can choose resolution scan modes to suit their specific requirements. 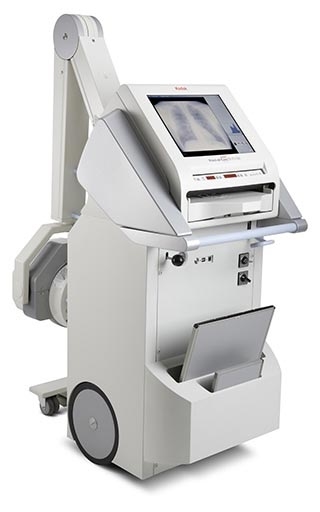 KODAK Point-of-Care CR-ITX 560 System - the affordable mobile x-ray solution for value-conscious healthcare providers.